Here comes friday 13th, on april 2012!! Question: What would bring more evil than a heavy metal concert on that day? 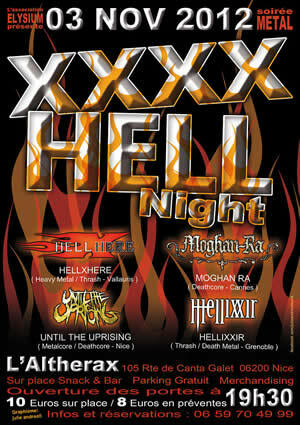 Answer: An heavy metal concert with HellXHere !! By the way, JC Jess and another guest will help us to set the stage on fire !! Things take place at Mistral Palace in Valence (FR) at 8:30 PM.